Lots of small carts and desks, drawing table, card table and chairs. Women's clothing (size 6 - 12) Kitchen ware, some vintage. Toys and puzzles,classical guitar. Cookbooks, vacuum and carpet cleaner. Some girls clothes 18 month- 7/8, women's clothes size size medium to xl, mens clothes size m- lx, toys, books, furniture, home decor, misc and more. Greeting & Christmas Cards (25 Cents), Wrapping Paper, Books, Chain Saw, Amish Heater, Quilts, 3 Kerosene Lamps, 2 Brass Lamps, Ladies Jeans, Blouses, Shoes, Much More. Something for Everyone. COME SEE! Lots of stuff!!! Stop by. Everything that remains is 50% off on Saturday- you do NOT want to miss it! 2 Extra Large Estates and a Business Liquidation Sale all in one location!! CASH AND CARRY ONLY- NO EARLY SALES- THANKS. 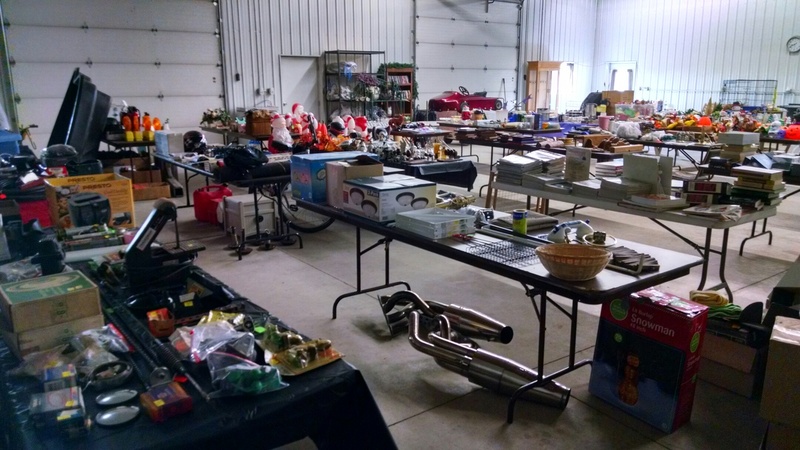 Sale put on by Merge & Purge LLC Estate and Liquidation Sales. ***THIS SALE IS INSIDE OF THE OLD WALMART BUILDING IN OWATONNA- 1010 Hoffman Dr. Owatonna, MN 55060. YOU WILL ENTER THROUGH THE FRONT OF THE BUILDING. Snowblower, 37” Vizio TV WITH stand, twin size wooden bed frame/mattress, 3 couches, 1 twin size hide-a-bed/couch (great for college dorm), tall set of nice lockers, outside bench, many rustic items (doors, windows, door knobs, enamelware, tea kettle, copper tub, washtubs, stools, screens, skis, etc. ), fishing poles and many fishing accessories, vintage baby buggy’s, card tables and chairs, kitchen tables (one is an adorable vintage set), futon, rocking chairs, roll-top desk, numerous lawn and garden tools, Stereo System, wooden shelving units for storage, hutches, lawn chairs, Garden Shredder Machine, laundry baskets, small stand, step stools, ladders, some collectible household items, art work, paintings, nice decorative mirrors, picture frames of all sizes, photo albums, loads of cookbooks and books, vintage aprons, many new in box items, blankets, bedding, towels, rugs, pillows, etc., bathroom décor, baskets, side tables, vintage and antique storage chests, wooden toy chest, games, DVD’s, VHS tapes, cassette tapes, VCR’s, CD’s, records, many furniture items to repurpose, gun cabinet, 2 outdoor tables, wicker furniture set, small spindles for décor, record players, 2 queen size bedframes, 1 twin size bedframe and 1 full size bedframe, 2 leaf blowers, numerous size desks, brand new lighting for residential and commercial, Avon Collectible perfumes/powders, bags of collectible McDonald’s boys, Kitchen (toasters, microwave, dishes, silverware, crockpots, waffle maker, bread makers, glasses, pots/pans, serving plates, Pampered Chef, etc. ), heavy duty cords, numerous pots, lawn tractor, sprinklers, MN license plates for decorating, picnic basket, golf clubs, large amount of golf balls and golf towels, small safe with key, umbrella’s, vice for garage, hoses, weed wacker, Authentic Beer Steins, tea cup/saucer sets, Holiday Décor, tables of household goods, more lamps than we can count, phones, slide show items (projector and storage containers), arts and crafts, newer hunting boots, men’s and women’s shoes and clothes, decorative plates, vintage hats with boxes, 3 projector screens (great for outdoor movie nights), Cedar Chest, large lot of old wooden crates, hose reel, 3+ cloth sitting chairs, office chair, book shelves (different sizes), coffee tables, old wooden sleds, shop vac, homemade ladder ball game, oodles of jewelry! !, luggage, fans, plastic storage bins (all sizes), adult bikes, and on and on. Table & Chairs, Electric George Foreman Grill on Stand, Vacuum Cleaner, Carpet Steam & Vac, Beginner Guitar (Brand New), Boys Teen & Pre-Teen Clothing, Girls Junior/Teen Clothing, Bedding, Pillows, Blankets, Rugs, Curtains, Shoes & Boots, Scarves, Mittens, Socks, Bags, Purses, Backpacks, Children's Sleeping Bags, Prom Dresses, Halloween Costumes, Games, Books, Puzzles, Misc Kitchen Dishes & Utensils, Lamps, Miscc Holiday Decor, Various Water Bottles & Kitchen Storage Containers, Various Hanging Shelf Units, Jewelry & Girl Hair Accessories, Make-Up, Various Art Supplies & Craft Items, and Much Miscellaneous. Everything is priced to sell - open rain or shine and cash only! Huge garage sale!! Don’t want to miss!! Home Decor, nice twin bedding, name brand girls clothes sizes 3t and 4t, girls justice size 14-16. 2 Graco high chairs, booster seat for table, furniture, bike toddler seat that attaches to adult bike, and lots more. Items include household, Craftsman tool chest, Cosco step-stools, bikes, headboards, chairs, plants, vintage desk, picture frames, silverware, garden decor, trunk, and curtains. This sale is located at the old Ganser Brewery. Name Brand Clothes..., Girls 6 - 8, 10 - 14, Boys 10 - 14, Women's S - M, XL, XXL, 1X, Men’s S-M, 6 Men’s Overalls, Coats, Lots of NICE Shoes, Nice Boys Cleats, Halloween Costumes (NICE), including Gorilla Suit, Girl Zombie, Kangaroo, Jewelry Lots of NICE Toys, Dolls, Doll Clothes, Doll Strollers, Play Tupperware plate sets, ‘Build a Bears’ with Outfit and Horse set with Stable, Lots of Trio Block Sets (NICE), Barbie Car and Golf Cart, Girls bike, Child’s Roller Blade Pads, Lots of nice home decor, Lamps (One set is two lamps and standing lamp), Large to Small wall pictures, Art Mom Pictures (Great for Kids Room or Play Room), Precious Moment Figures, Picture Frames, Blankets, Linens, King Comforter, Lots of Doilies, Lots of Kitchen items, Princess House, Crystal Bowls and other Items, Pots and Pans, Bread Maker, Home & Garden Fluted Bowl and Bean Pot, Pampered Chef Stones, Silverware Sets (2 everyday sets and 2 nice sets for holidays in wooden box), China Set with extras (Serving bowl, Coffee Pot, platters, etc), Utensils, Pyrex Bowls and Pans, Rocking Chair, Select Blinds (New), New Closet Organizer, New Christmas lights, New 3-Light Vanity, New John Deer Mail Box, Wooden Crutches, Paper Towel Dispenser with 9 Rolls, Piece of Linoleum, Lawn items, Gardening Tools (Rake, Potato Fork, etc. ), Collapsible Dog Cage (Like New), 4 Christmas Trees (4 ft), Suitcase, Old Cameras, Kool Cat Scooter (needs battery), Lots of Misc. boy & girl name brand clothes (variety of sizes), name brand adult clothes, toys, board games, PS games, DS games, housewares, bikes, jewelry, shoes and much more! Tile saw, 9" band saw, Bosch 18V cordless tools, treadmill, flat top griddles, Cabelas V bottom LP deep fryer, Ab Rollers & household goods. Lots of Womans clothes sizes small to xxl, kids clothes: boys size 4 to 7, girls size 10 to 16, home decor, household items, purses, bags, shoes (kids & adult) DVDs, decorative pillows, dining room table & 4 chairs, blankets, kids toys, 4 barstools & much much more!! 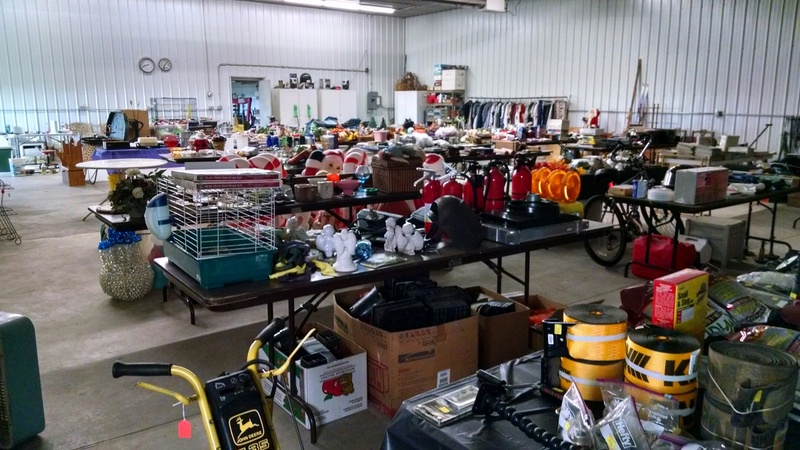 HUGE MOVING SALE Something for everyone, clothes, furniture, housewares, antiques, toys, tools, lawn mower, snow blower, home decor and great Christmas decorations. Dish set for 12. 1975 Chevy Lagoona. Friday 11-6 and Saturday 8-12. Do I need to add anything else?